I painted Morgan La Faye in1990 for Llewellyn's 1992 Goddess Calendar, she was the cover. She was the very first in this Goddess Icon series! She is included in the Goddess Oracle. Mor meant "sea" in several Celtic languages, and Morgan was a sea goddess whose name still survives in Brittany where sea sprites are called morgans. 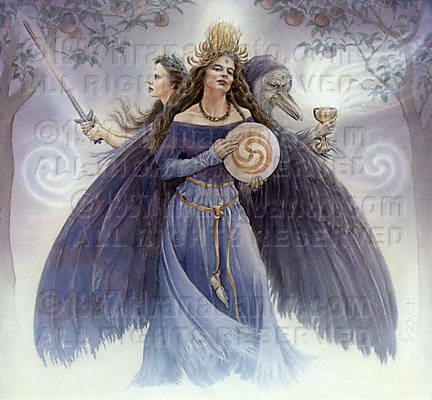 The most famous sea goddess was surnamed Le Fay, "the fairy"; in Welsh mythology, she was said to be a queen of Avalon, the underworld fairyland where King Arthur was carried--some said by Morgan herself--when he disappeared from this world. In some legends, Morgan was Arthur's sister, whereas in other tales she was immortal artist and healer who lived with her eight sisters in Avalon. Some scholars claim she was the same goddess as the one called, in Ireland, Morrigan. That crowheaded goddess was a battle divinity, which suggests that Morgan might also have been a goddess of death. Indeed, there is dispute over whether her surname means "the fairy" or "the fate." If Morgan were not a mere sea sprite but the goddess of death, that would explain her unfriendly character in Malory's Morte d'Arthur, where Morgan appears as the king's dreaded foe, constantly plotting his death, and in Sir Gawain, where she seems similarly bent on the destruction of the king and his Round Table. If Morgan were once the queen of death, ruler of the underworld and of rebirth to the early Britons, a cultural shift could easily have seen her reinterpreted as a powerful demonic force bent on destruction.